Our research indicates that Uxin's sales volumes and revenue may be overstated by as much as 40%. The founder and two other insiders have managed to take around $450 mln out of the company pre- and post-IPO through a complex set of lending deals and share swaps. 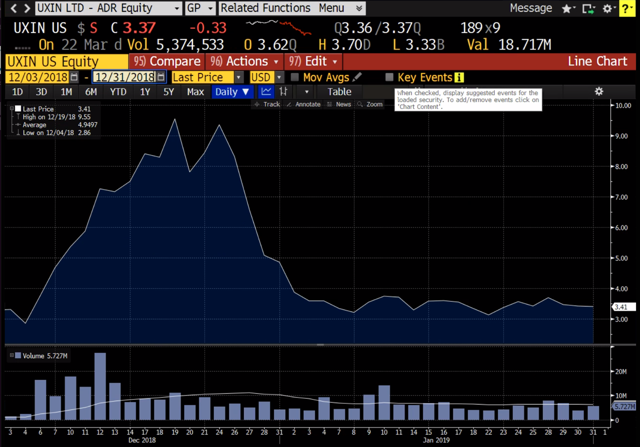 Financial statements for the company's Chinese operating subsidiaries indicate a staggering level of debt that is unreported in the U.S.
We are short Uxin and believe the company in uninvestable. In the dark, fraud-infected world of used car sales in China, Uxin has managed to sell its bill of goods not just to Chinese consumers but to U.S. public markets. Detailed exposés have shown that all China’s online used-car dealers exaggerate. 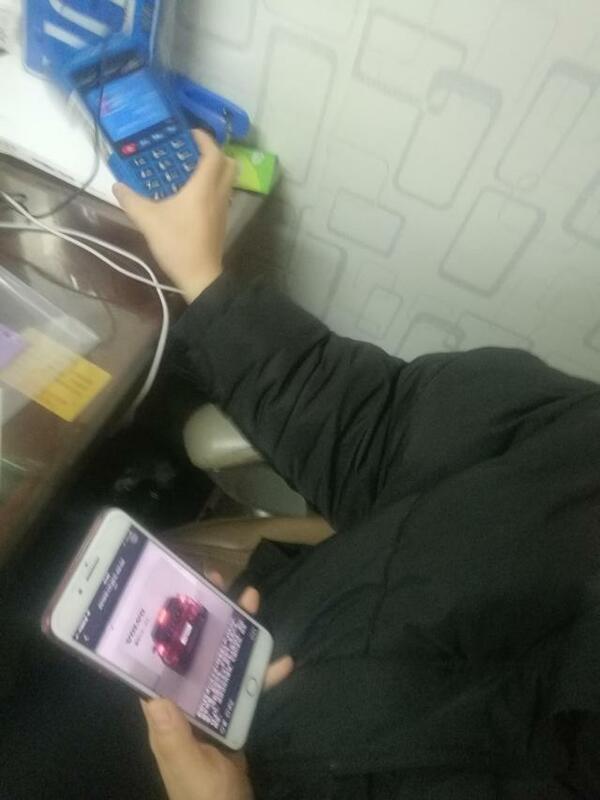 However, Uxin came up with the most sophisticated strategy to lie about its sales: it got auto dealers all over China to flush unrelated sales through Uxin’s accounts using a special Point of Sales (POS) machine. The fake revenue tool paid off nicely. Hemorrhaging cash, Uxin desperately needed an IPO in 2018 simply to stay alive. Uxin accomplished that debut on June 27 last year. The company garnered a valuation of about $2.7 bln despite just $290 mln in 2017 revenue and heavy losses. The only way to achieve that was by reporting massive growth—and report growth it did. Uxin claimed on IPO that, from 2016 to 2017, its revenue increased by 137% and transaction volume grew by 68%. Before the shares even started trading, company founder Chris Dai Kun managed to capture $100 mln for himself by selling equity. And before the IPO lock-up expired, he pulled off a sale that earned him another roughly $180 mln without needing to disclose a management sale to shareholders. It was a complex deal, done by apparently engineering a margin call on shares collateralized to a company that is now deeply embroiled in a corruption scandal. The strategy used for this share sale was, we believe, highly suggestive of collusion with this Chinese financial institution, which is now under investigation for share manipulation and two of whose top executives have been arrested. Uxin is an online marketplace for used cars, selling both to dealers and to individuals. It was founded in 2011 as an auction site for dealers, but the company found that it could add little value to these transactions and moved to the consumer market in early 2018. The company also pushed its lending business for second-hand cars, going from 38% of revenues from “loan facilitation” in 2016 to 55% in the most recent quarter. Second-hand auto sales and financing are crowded fields in China, with at least nine well-financed competitors, including Guazi, Renren, the listing site 58.com, and Yixin, which provides financing for second-hand cars. The company reported selling a total of 814,498 cars in 2018, which would represent as much as 59% of China’s online second-hand auto sales or 6% of China’s whole second-hand auto market—if the numbers were true. Even in its reported financial statements—which omit huge liabilities--the company is in a perilous financial state. To try to persuade investors of its financial stability, in Q1 2019, Uxin basically relied on financial manipulation. It decreased current assets and increased current liabilities. It reduced its advances to sellers by 24% and almost doubled the proportion of advances it takes from buyers, to 33% of revenue from 17% of revenue. Uxin also sold a bit of equity. As it is, with ¥801 mln in the bank and burning ¥250-300 mln each quarter under the best of circumstances, the company will likely have to raise cash just to keep the lights on. Those already poor numbers were in the company’s report to investors. It also told investors that, at the end of 2017, before the IPO, the company had $75.7 mln in net debt (cash and near cash minus short- and long-term borrowings). The Chinese financials tell a different story. On a non-consolidated basis, at end 2017, those statements showed $1.76 bln in net debt. We believe this is undisclosed and not eliminated in consolidation. We obtained financial statements reported to Chinese tax authorities by 16 of Uxin’s Chinese operating companies, including all those named as material in Uxin disclosures. Companies with the largest assets and liabilities are wholly owned by Uxin, not Variable Interest Entities (VIEs). A single subsidiary, Kaifeng Financing Lease (Hangzhou) Co. Ltd., represents fully three-quarters of total liabilities across the 16 companies. Those liabilities cannot be consolidated away. Kaifeng’s Chinese financial statements show that Kaifeng had long-term borrowings of $2.05 bln in 2017 and $3.59 bln in 2018. The debt number likely stems from cars that Kaifeng is notionally renting to buyers, who receive ownership at the end of the lease period for ¥1, according to a contract we viewed. Kaifeng appears to carry cars on its balance sheet purchased with cash from two shadow banks—something company management explicitly claims does not happen. Management says 48% of cars financed by Uxin in 2018 were financed on a financial leasing basis. But Uxin goes far beyond brushing: it came up with a way to generate circular “revenues” using a specially designed POS. The machine directs all receipts first to Uxin, regardless of whether the transaction was a Uxin sale or not. Uxin then pays the auto dealers and agents. The POS is simply a payment mechanism at dealers, like any machine to run credit or debit cards. 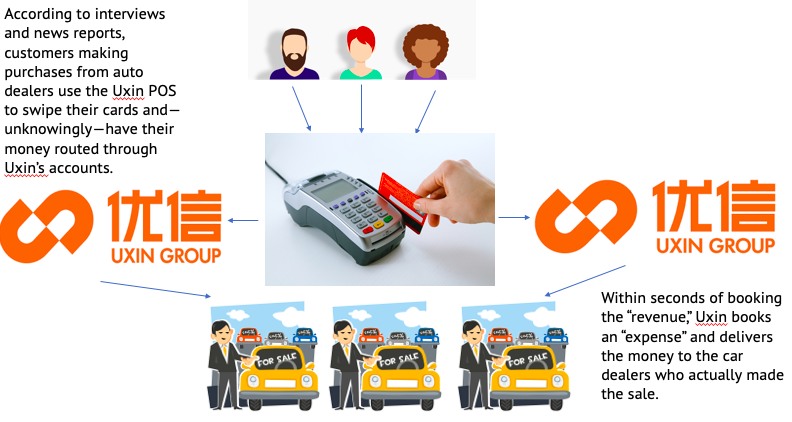 Uxin may be responsible for 5% or 10% of sales at a participating dealer, but Uxin tries to capture the other 90-95% of sales by taking payment through the Uxin POS. We confirmed in eight interviews, including with a former Uxin financial manager, that Uxin counts as its own revenue dealer sales in which Uxin had no hand. For example, if a given dealer sells five cars a month via Uxin but sells 100 cars in total off the lot each month, the other 95 sales could be counted as Uxin’s revenue as long as they are processed using the Uxin POS. Uxin incentivized dealers to adopt the POS by subsidizing the banking charges, which average 50-60 bps. This makes sense, given how much money Dai made from transacting in his stock—he needed investors to believe in growth, no matter what the cost. Uxin came up with an innovative solution: automatic redirection of funds to the appropriate account. Auto dealers and ex-Uxin financial managers told us that Uxin designed software to first wash funds through its own account then automatically route transactions to the designated recipient in a two-stage process. A former Uxin financial executive told us that Uxin wanted to get hold of transaction revenue “from all the car dealers in all of China and make it Uxin’s.” This was to fool to investors into believing that Uxin’s transaction and sales volume were huge. A former executive of Uxin’s financial division justified the POS policy by saying that the machine was designed to collect data on all the transactions in the second-hand auto market so that Uxin would have visibility into the market. But he said that “The transactions that really belong to Uxin maybe represent about one-third of what Uxin reports.” In other words, Uxin could be overstating transaction revenue by two-thirds. Uxin employees say that the price war among big payments companies like Alipay and Tenpay has made the Uxin POS less competitive, and Uxin POS penetration is declining. Interviewees at used car dealers told us that Uxin collects unrelated contracts and car listings to claim as their own. 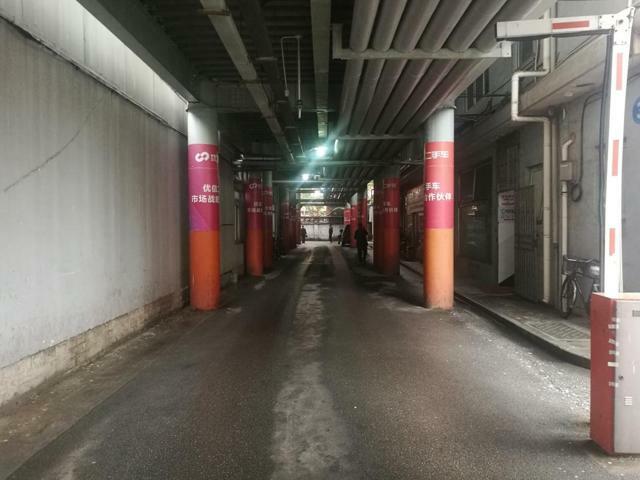 On March 4, 2019, we interviewed a salesperson at the Jiading District Second-Hand Auto Market in Shanghai, a market that cooperates with Uxin and uses its POS. At the end of the month, the e-commerce salespeople have to meet their quotas. “So they pay us fees and not only run fake sales through the POS but also collect contracts and legal receipts from us” to run through their accounts via the POS. We interviewed staff at several second-hand auto markets in Beijing, Shanghai, Shijiazhuang, and Chengdu. “Every loan salesman at Uxin has to issue at least five loans per month,” said one interviewee. 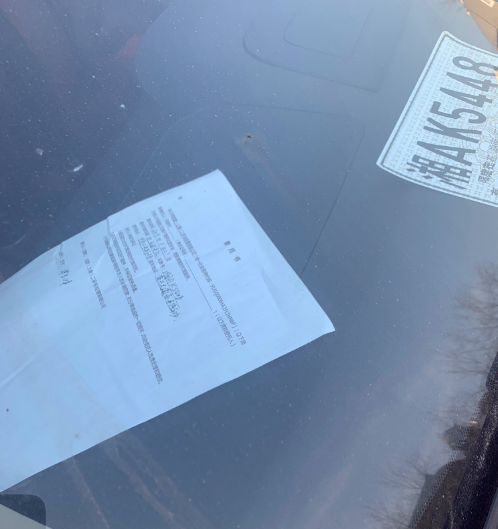 “If they do not make this number, they pay the car dealers for some sales receipts to add to their sales results.” This manager said that auto dealers work with Uxin to create fake sales and are reimbursed for associated costs, like sales tax. We had a piece of software built that searches the Uxin website and creates an Excel entry for each car, which has a unique URL. Our team leaders are three of China’s top data scientists, who come out of China’s biggest internet companies and are well versed in techniques used by Alibaba, JD, Vipshop, and others to make their numbers look impressive to investors. The team that built the tool numbers around 30 people. We accessed 37.5 mln pieces of data in the scraping process and downloaded the data to a massive spreadsheet that lists the cities covered by Uxin and lists the cars advertised as available in each city. We have high confidence in the soundness of the software. It showed us that the site actually covers 399 cities, not the 900 the company claims. The software also demonstrated that the site overstates the inventory of cars. IR claims there are 200,000 unique listings. We verified 103,600 on March 18. The website itself offers a number of “available cars” in each locality, which add up to 35.09 mln. Here is a small sample from our data showing car listings across the top and cities along the left side. The “1” indicates that a car appears in the listed city. If you look down the columns, you will see how each car listing is repeated in almost every city. So Uxin is posting the same car hundreds of times on the different city sites, even though it may be logistically impractical to actually purchase the cars, since many are thousands of miles away. Ask yourself this question: If I have 50 cars for sale in New York, but I have a website in every state, do I have 50 cars available or, as Uxin maintains, 2,500? The company is pulling every lever it can to print numbers that look less bad. While most online players charge for listings, Uxin gives free listings to dealers to give the illusion of scale. That means that many of the cars Uxin lists as “available” are actually being sold by other companies or may not be available at all. Dealers estimate that as many as 40% of the listings are of cars not actually sold by Uxin. Some dealers list the same cars on 10 different sites. Redundant listings: The site displays cars for sale that are also offered on other websites. Dealers we spoke with said they posted inventory with Guazi, 58.com, Che168, Dafengche, and their own websites. That means that a portion of the displayed inventory is sold by other sites, not by Uxin. 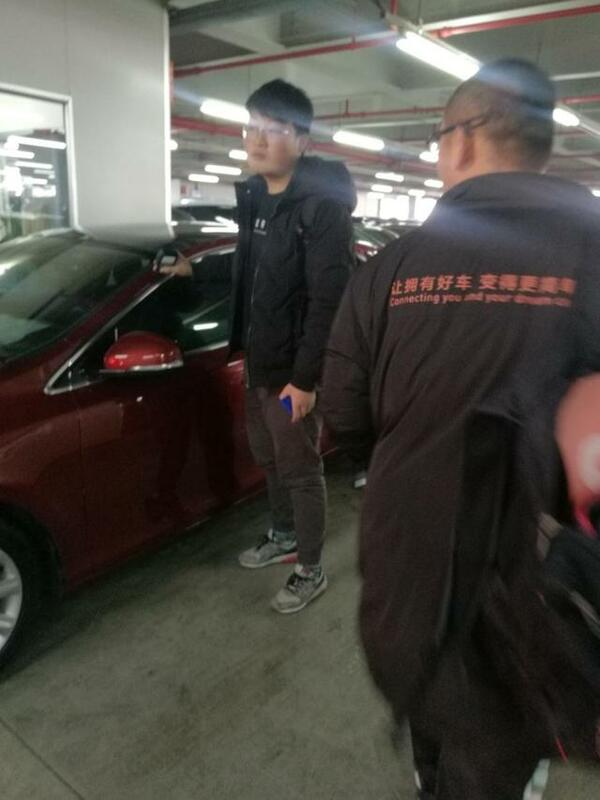 The employee pictured above on the right told us that this car is being offered on both Guazi and Uxin. Photo by J Capital investigator March 2019. Here is one of the several cross listings we found, of a 2017 Passat registered in August 2018, with 10,000 km on its odometer, listed on Uxin and Che168. Cars that have already been sold: The majority of cars are sourced from dealers, and the listings often persist on the site after the dealer has sold the car offline, according to the manager of one of China’s largest second-hand dealers, in Shanghai. “The ecommerce companies, in order to make their numbers look good, knowingly are not going to take down their car listings,” said this manager in an interview. Uxin’s strategies to create fake revenue are well known in China, having been the subject of numerous blog posts and articles in the press. An analysis that appeared in several outlets in early 2017 demonstrated that Uxin makes its inventory and turnover appear much bigger than they are by posting multiple photos of the same car, listing cars for sale that have already been sold, and taking photos of all the cars on a used car lot and posting them without authorization. The author of the post found that less than 5% of the cars listed for sale on the Uxin website were posted just once; most listings were repeated at least 20 times on different pages. Uxin also exaggerates the number of results for a search. Another set of stories demonstrated that Uxin misrepresented the number of cars it had on offer by posting duplicate listings and listing for-sale cars that had already been sold. The lower inventory suggests that actual sales transactions are much lower than Uxin claims. There are a few other ways to estimate what actual sales might be, and most of those ways bring us to conclude that Uxin is overstating sales volume by around 40-50%. As of mid-2018, the company reported 5,963 salespeople. In our interviews, Uxin employees said that the best sales staff could sell up to 10 cars per month, but that most averaged three to four sales per month. Assuming that each salesperson sells five cars per month, the company is able to sell 357,780 cars in a year. But Uxin reported selling 814,498 cars in 2018. Of those, 319,672 were sold to dealers. Presumably, those sales require less sales participation. Nevertheless, the numbers suggest that Uxin may be overstating sales by 40-50%. We have confirmed with several former Uxin employees that Uxin itself purchases cars to resell. This is not disclosed in any filings we were able to locate. Employees estimated the owned cars at about 5% of inventory. We believe Uxin buys and resells cars in order to increase turnover. 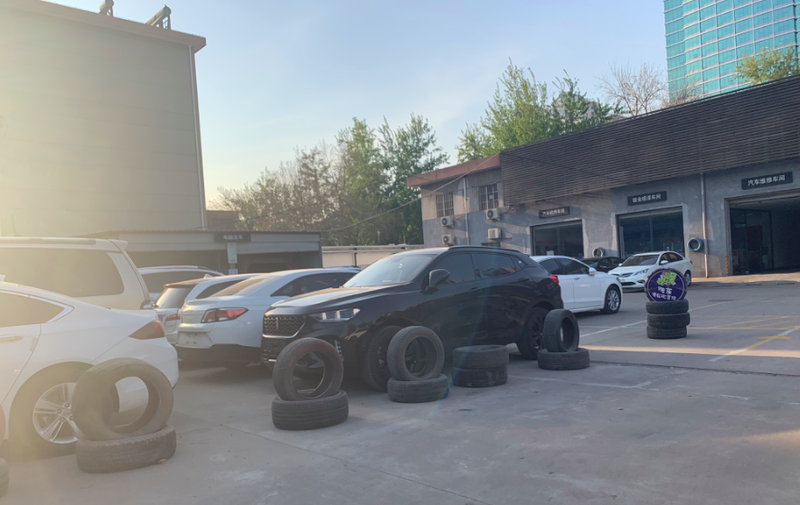 We visited a Uxin lot in the city of Shijiazhuang and found about 15 cars that we believe had been purchased by Uxin because they had been issued temporary plates. When a customer buys a car, the original plates are canceled and new permanent plates in the buyer’s name issued. The temporary plates seem to indicate that no buyer has yet been found. Uxin appears to be intentionally overstating the value of cars in order to borrow more money. We are not certain who uses the extra loans, but we are sure that Uxin overstates its car values and overstates the amount of loans required. This dramatically raises the financial risk for Uxin, because repossessing and selling the cars carried on its balance sheet would not cover the associated loan amounts. Although Uxin claims that it merely guarantees loans for “financing partners,” its financial leasing company, Kaifeng, has ¥24.1 bln in assets and an equal amount of loans, equivalent to 389,000 cars at China’s average used-car price of ¥62,246. IR confirmed to us that Uxin is on the hook for 100% of its loans. Kaifeng management claims not to hold any cars on its balance sheet. But the evidence from Kaifeng’s balance sheet indicates this is simply not true. We obtained an actual Uxin contract from a salesperson and have seen contracts excerpted in several lawsuits. The contract we obtained assigns the car as collateral to Kaifeng while the buyer retains ownership. In many of the lawsuits available online, cars purchased by consumers are registered to various Uxin subsidiaries, at least for an initial period. This clause, from the “Counter-Guarantee Letter of Commitment” that forms part of the Uxin contract documents obtained by J Capital, reads “I hereby guarantee: 1) The collateral is owned by me, and providing the collateral to Kaifeng does not violate any third-party rights nor does the collateral have any defects affecting its current value; 2) I guarantee that before signing this guarantee agreement I have not established a collateral or guarantee for the collateral (other than with Kaifeng’s agreement). The company has patented a device it uses to make video recordings of the cars that it compares with Google Glasses, saying that inspectors wear special Uxin goggles that detect car defects as they record. We have not seen inspectors use these goggles though we have seen them use a handheld device that apparently detects defects in the body of the car from accidents. A video of the inspection process is embedded here. But former company executives say that the inspection actually consists of “a visual inspection” plus an “inspection with a flashlight.” Hundreds of plaintiffs in lawsuits claim that Uxin sold them defective cars, failed to report that the car had been in an accident, changed the odometer, or even neglected to report a completely different engine in the car. Several buyers claim that the 300-odd-point inspection of which Uxin is very proud is just for show. A lawsuit filed against Uxin’s Shanghai subsidiary, Yougu, in Hubei Province in January by a buyer named Hu Huanghuang alleges that Uxin sold him an Audi Q3 for ¥250,000 ($37,252) with an inspection certificate and a maintenance contract. However, the suit goes on, he discovered on driving the car that the engine had been removed and replaced with cheaper parts. A 2018 lawsuit filed in Tianjin alleges that Uxin fraudulently issued an inspection certificate certifying that a car had not been in any serious accidents and facilitated a sale of the car for ¥86,000 ($12,806). Uxin was required to repay all charges, which amounted to ¥101,690 ($15,143), and to pay damages. A buyer filed suit in Liaoning in 2018, because she managed to verify that the car she purchased on Uxin had had its odometer turned back. According to a news report, a man purchased a second-hand car through Uxin for a little more than ¥100,000 ($14,891). After registering the car, he learned that, despite the multi-point inspection conducted by Uxin, the car had been in a serious accident and could not be driven. He said Uxin refused to reimburse the buyer. 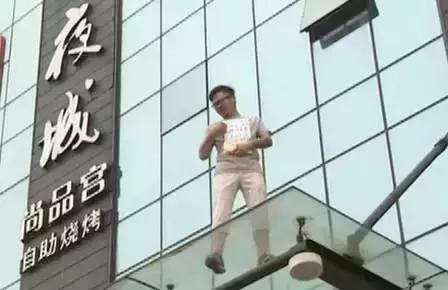 He threatened to jump off a building if Uxin did not return his money. 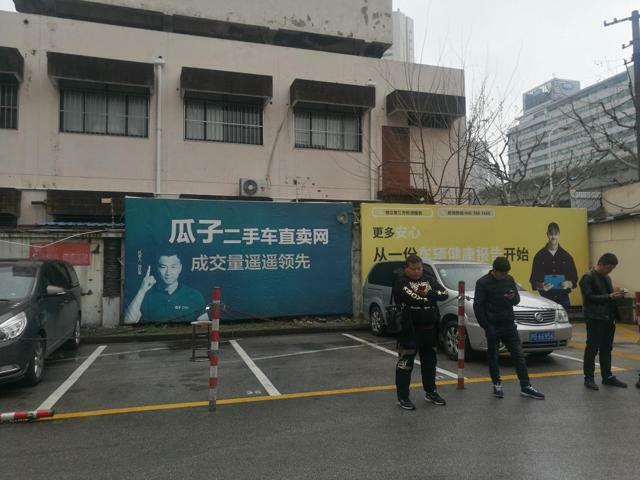 Two hours later, after a crowd had gathered, a Uxin representative arrived and told the man, named Ji, that the company would “take responsibility” and presumably repay him for the car. Financing down-payments: Higher valuations allow Uxin to finance down-payments for buyers who do not have a lot of money to put down. Banks lend 70-80% of the value of a car. On a ¥100,000 car ($14,900), that would mean the buyer would need to come up with ¥20,000 ($2,980). But if the customer wants to put down just ¥5,000, she must borrow ¥95,000. To do that, the car must be valued at ¥118,750. Banking rules would then allow Uxin to lend the customer 80% of the “value” of the car, or ¥95,000. Improved loan revenues: There is copious testimony in the Chinese press and in legal cases attesting to deceptive lending practices by Uxin that boost loan values. An article published on JRJ (“Finance Street”) on December 3, 2018 provides a description: A man in Ningbo purchased a used Cadillac and was encouraged to take a Uxin loan. Uxin added so many fees that the loan value was ¥248,500 for a ¥168,000 car. Similarly, “on November 9, 2018, I bought a car from Uxin Second Hand Auto,” says a blog post carried on a site called “Fast Lane Complaints.” The car cost ¥60,000 ($8,940), and Uxin assessed it at ¥160,000 ($23,841) and offered the buyer a loan of ¥140,000 ($20,861). We sent investigators in posing as buyers to verify that Uxin requires customers to make down-payments before reading a contract, something online posters have complained about. That practice facilitates over-valuing the cars. We obtained 2016-17 financial statements for Uxin’s direct subsidiary Kaifeng Financing Lease (Hangzhou) Co., Ltd., a wholly owned Uxin subsidiary and the sole subsidiary of Uxin that is licensed to provide credit. That company has a mind-boggling ¥24.1 bln of debt on its books. In U.S. dollar terms, that’s $3.6 bln, more than twice the market capitalization of Uxin. The debt is not disclosed in U.S. financial statements. Kaifeng is the principal engine of Uxin’s China business. Kaifeng owns the cars that Uxin finances and notionally leases them to the buyers. The company’s reports indicate that it carries loans collateralized by the cars whose sale it is facilitating. But if the value of the cars is significantly overstated, then the collateral coverage is inadequate. 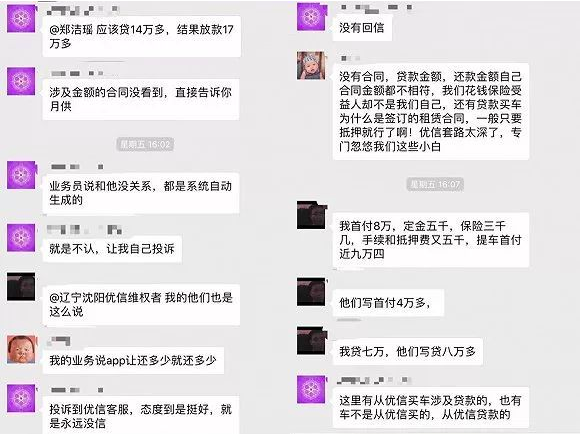 Hundreds of blog posts and news articles in China, like a post on 21cn and an article in Sohu news called “Uxin Loan Sharking: Cheating People Out of their Sweat-Money,” that claims interest of 50% of the price of the car, accuse Uxin of using deceptive practices to charge interest rates that compute to about 18% annually. Lending practices that makes consumers feel cheated, when combined with high interest rates, make the default risk especially high. Based on contracts we have viewed, we believe that Uxin takes the cars as collateral and technically owns them for the term of the “lease.” As of December 31, 2017, Kaifeng Financing carried ¥24.08 bln in borrowings and ¥24.14 bln in long-term assets. The assets should be cars held against customers’ payment of their loans. In its IPO prospectus, Uxin reports: “Cars purchased through our loan facilitation service are pledged as collateral to secure the loans.” We suspect that this massive debt facility might have been used to take money out of the country. Uxin’s default risk is enormous. Kaifeng is already teetering on financial ruin. If the collateral—the cars—are as overvalued as evidence suggests, just a few defaults could send Kaifeng into insolvency. We purchased a credit report on Kaifeng. That report showed delinquent loans for a business unrelated to what Uxin reports: “factoring for imported and exported cars.” A Chinese news article that appeared in 2015 did mention that Kaifeng exports second-hand cars on behalf of Shenzhou, a large rental service provider. So Uxin is exporting or financing the export of used cars. It would be nice if investors knew about the risks this presents. We recently checked in with nine dealers—in Beijing, Shenzhen, Xian, Suzhou, and Shanghai—about their sales numbers through Uxin. Those who volunteered sales volumes for the current quarter all said that sales had declined in 2019. A Shanghai dealer said: Last year we sold 8-10 cars per month through Uxin. This year, in January, we sold one, in February four, in March through the 27th, two. This dealer also said that his company offered the same inventory on 10 websites. A Xian dealer told us that they sold 193 cars through Uxin in 2016, 207 in 2017, and 163 in 2018. Another Shanghai dealer said his company had sold 36 cars through Uxin in the second half of 2018 and has sold 13 in the first quarter of 2019. A third Shanghai dealer has been listing on Uxin for a year but has not sold any cars. A fourth Shanghai dealer sold 63 cars through Uxin in 2018 and has sold nine in Q1 2019. Service locations in Shanghai for Uxin (top photo), Guazi (middle) and 58.com (bottom). Photos by J Capital China investigator March 2019. Many of the online auto dealers own offline second-hand car dealers, which enables them to purchase cars themselves if visible third-party sales numbers are low. 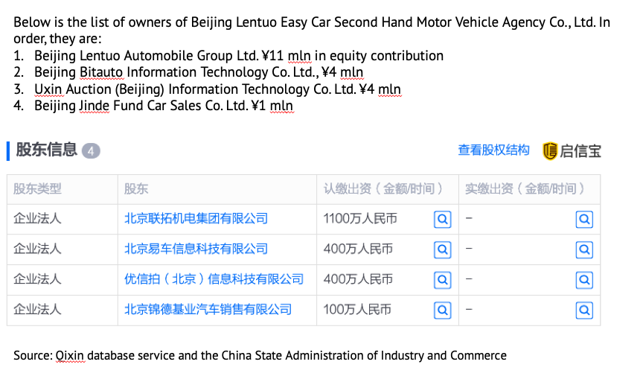 Uxin is no exception: the company has an undisclosed 20% stake in the Beijing Lentuo Second Hand Auto Market. Lentuo’s 45% owner is the auto dealer Lentuo, a famously unsavory Chinese reverse merger that was delisted from the New York Stock Exchange in 2015 after failing to respond to multiple queries from the SEC. GeoInvesting found that Lentuo had failed to disclose ¥250 mln in related-party debt. Lentuo announced the joint venture deal in 2014, saying that the JV would become China’s biggest online-to-offline car dealer, but Uxin has never disclosed it. The other owners are a subsidiary of the online auto dealer Bitauto (BITA) and Uxin, as well as another 5% owner. Buying and selling with this connected dealer would make it possible for Uxin to generate its own sales by creating circular transactions. One of our Uxin interviewees did not specifically know whether Uxin transacts with Beijing Lentuo, but he said that the online sales platforms set up offline auto companies to generate transactions and reduce taxes. Dai Kun took $280 mln out of Uxin immediately before and after IPO without reporting an insider sale. He did it in two stages, first taking $100 mln via a loan repaid in shares and then taking another $180 mln with a “forced” margin sale. IR told us that management has never sold shares—technically true but not really true. On first glance at the Uxin prospectus (see pages 173 to 176), it appears that Dai Kun received loans from Uxin to buy out shares in the company held by investment firms Bertelsmann and Amplewood. When examined closely, it is clear that Dai Kun used this loan arrangement as a smokescreen to take $100 mln in cash out of Uxin using share transfers in the 12 months before IPO. Dai Kun borrowed a total of $114 mln, including interest, from Uxin. This was revealed in correspondence with the SEC (see p 7). The first loan of $17.7 mln in May 2015 was used to purchase two parcels of shares from Bertelsmann and Amplewood. The second loan of $56.5 mln in July 2017 was used to pay $41 mln to Bertelsmann to purchase shares, while the remaining $18 mln was just cash to Dai Kun. Bertelsmann received $61.3 mln for the shares. Uxin paid the difference of $20.4 mln, and then the company recorded the payment as salary to Dai Kun (see Prospectus pages 122 and 173). 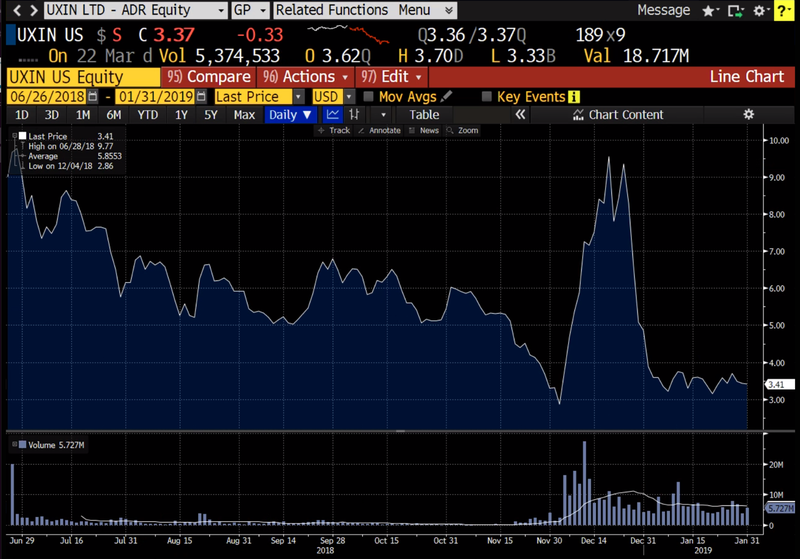 The third and fourth loans to Dai Kun in July 2017 and May 2018, of $22.8 mln and $10.7 mln, were just cash to Dai Kun; no shares were purchased. Dai Kun repaid the loan on May 28, 2018, one month before the company’s June 27 IPO, by transferring 31 million shares valued at $3.68 each, for a total $114 mln (Prospectus p. 176). Two weeks earlier, on May 14, 2018, Dai Kun had arranged for Uxin to grant him 17.7 mln shares at a cost of ¥589,631 to be recorded as compensation to him by the company when they vested (Prospectus p F-138). These shares vested on the day of the IPO (June 27) but in effect they replaced 17.7 mln of the shares redeemed in the transfer two weeks later (May 28) for a value of $65.3 mln. We estimate that the remaining 13.3 mln shares used in the transfer cost Dai Kun $7.2 mln, based on the issue price of the Series A and Series C shares that were transferred. Effectively, Dai Kun received $107.7 mln in cash from Uxin in loan principal forgiven with shares that cost him a total of $7.2 mln. This cash came out of a company that was losing massive amounts of money and borrowing heavily. Dai walked away with $100 mln in cash from the transactions just one month before IPO, when shareholders are normally subject to lock up. In October 2017, Dai Kun took out a $100 mln loan collateralized by 57 mln shares in Uxin, which he controlled via Kingkey New Era Auto Industry Limited, of which he owns 40%. The lender was a Chinese SOE listed in Hong Kong called China Huarong Asset Management Co., Ltd. (HK 2799), the largest distressed asset management company in China. Under the loan terms, receipts from a share sale in excess of the money owed would go to Dai Kun. The documents outlining the loan and how it was used to seize the shares were filed by Uxin in an SC 13D filling on December 27, 2018. Huarong added a margin provision to the loan on September 28, 2018 that came into effect on December 1, 2018. The provision said that, should the share price fall below a certain LTV ratio for five consecutive trading days, then a margin call could be made. Dai Kun could then partly repay the loan, put up additional capital within two days, or surrender the shares. On the five trading days following the provision coming into effect, from December 3-7, 2018, the LTV fell below that ratio, which we estimate was 1:2. Dai Kun was requested to pay up or provide further collateral. He did not, and the shares were seized on December 14, 2018 (see 13D p 10). Shares tripled in price on unusually high volume before the massive sale, causing Uxin to lose 21% in a single trading day and then to fall by 64% in two weeks, as Huarong sold out of its position. The average volume of shares sold was 800,000 per day in the seven months before December 1, 2018, falling even lower, to an average of 400,000, in November 2018. In December, however, the average daily trade was 9.6 mln shares, an increase of 24 times over November. While the stock price in the first few days of December was the lowest since listing, it climbed to an all-time high on December 19, around the time the lender started to sell. Uxin filed an SC13D disclosure on December 26, 2018, one week into the massive sale of shares, so shareholders had no warning. We estimate that two-thirds of the 57 mln shares seized had been sold off before the disclosure. On the day of disclosure, the stock price fell 21%. No lock-up provision was attached to this sale. The loan terms stated that, when the shares were seized for a margin call, they could all be sold, and any remaining funds after repayment of the $100 mln would be returned to Dai Kun. The documents with all of this information outlined were filed by Uxin in an SC 13D filling on December 27, 2018. The windfall from that sale put roughly $180 mln into Dai Kun’s pocket, as we calculate below. We believe Huarong started to sell the shares from December 19, 2018, shortly after it issued an instruction letter to Dai Kun. We estimate that up to 95% of those shares could have been sold before December 31, 2018—China Huarong did not file an ownership statement for the quarter ending December 31, 2018. We further estimate all of the shares were sold off by end of January 2019, for a total yield of $449 mln, at an average price of $7.86 per share. That would have delivered Dai Kun roughly $180 mln in cash from the sale. Two other insiders that co-invested in Kingkey with Dai Kun, also subject to IPO lock-up, were Chen Jiarong and Jimmy Ching-Hsin Chang. Under the same assumptions, they made $90 mln and $180 mln, respectively, from the sale. This activity also went unreported as insider sales. China Huarong is now embroiled in a corruption scandal. Its chairman was arrested and charged with corruption on November 7, 2018. The chairman of subsidiary Huarong Real Estate Co, which signed the loan with Dai Kun, was arrested and charged with corruption on January 22, 2019. The corruption case against the two chairmen is based on manipulating stocks in Hong Kong. The timing of the margin call and share sale was the month after the first corruption case, and the share liquidation was completed before the second. We do not think this was a coincidence. We believe it is just a matter of time before this loan and the corruption investigation are revealed to be related. Huarong, with its huge balance sheet, could easily manipulate trading in Uxin shares if it chose to. We believe the Uxin trading incident bears the hallmarks of collusion and could make Uxin the focus of investigators. The loan to Dai Kun was made in October 2017 by China Huarong Asset Management via Huarong Real Estate Co. and then another four entities before, ultimately, a special-purpose BVI vehicle was used for the loan. The loan was made before Uxin was listed, meaning that the share collateral was not liquid. That is very unusual, first, because of the risk that an IPO would not occur. Second, the shares used as collateral were not subject to lock-up. And third, the original loan did not include a margin provision. A margin provision was added on September 28, 2018 and came into effect on December 1, 2018. If it turns out that Uxin had anything to do with abetting Huarong in the huge December sell-off, Uxin could be investigated in the related corruption case in China. We believe that the Uxin edifice could collapse without warning with just a small rise in market delinquencies. A look at Uxin’s reported balance sheet betrays a company that is not only insolvent but careening toward default. Obligations are absolutely staggering—and undisclosed. Uxin claims that it ended the bulk of its financial leasing business in 2015. As of year-end 2018, the company reported only $68.8 mln in financial lease receivables on the accounts reported to U.S. investors. Uxin reports that it merely facilitates loans from “financing partners.” The company claims that the only loans it carries on its own balance sheet are financial leases provided to dealers and loans to consumers that were originated before September 2015. But Uxin’s financial leasing subsidiary, Kaifeng, holds ¥24 bln in long-term loans and ¥24 bln in “other receivables.” This is against shareholders’ equity of just ¥436 mln and cash of ¥2.19 bln. This debt has not been reported to U.S. shareholders. The most recent Uxin balance sheet, for the period ending December 31, 2018, reports long-term borrowings of ¥481.8 mln and total liabilities of ¥4.97 bln. Although the company says that it works with many lending companies, much of its business is through its financial leasing subsidiary, Kaifeng, as is amply proven by lawsuits and aryicles in the Chinese press. 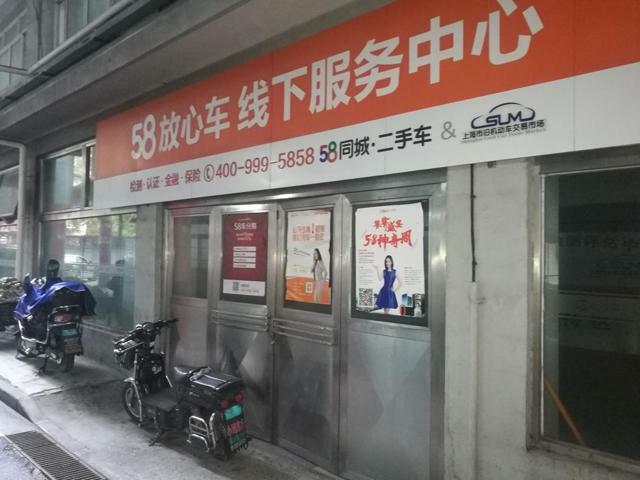 Kaifeng has 67 branches around the country to help process its loans. That Kaifeng is the recipient of loan payments is also evident from many contracts filed as part of legal proceedings by customers who feel they have been cheated. The company does not disclose enough to indicate where those borrowings come from. We purchased a credit report on Kaifeng from a subsidiary of the People’s Bank of China, and that report indicated that Kaifeng does not have bank debt despite the company’s report to China’s tax bureau indicating ¥24 bln in long-term borrowings. That could mean that the source of financing is shadow banks. Indeed, we know from interviews with Uxin salespeople that two shadow banks provide most of Uxin’s consumer loans: WeBank, which belongs to Tencent, and the less-known internet bank XWBank. Press reports also indicate that the company has sold asset-backed securities to raise money. 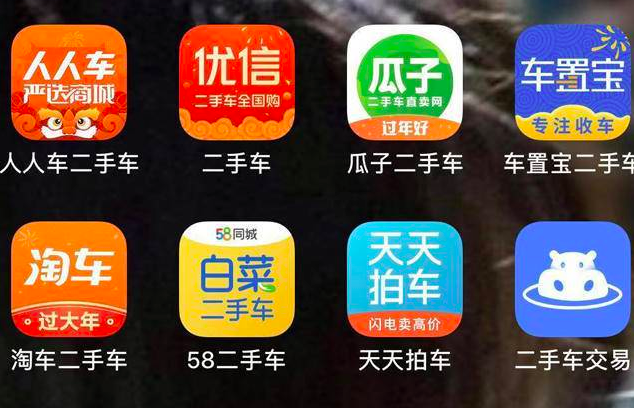 In 2016 and 2017, Uxin was selling its ABS to the public on online platforms such as zichan100 (“100% assets”). ABS is the preferred financing strategy of direct competitor Yixin Group (2858 HK). But Yixin fully reports its debt. And Yixin is profitable. In 2017, doing the exact same business, Yixin offered a better return on assets. Below are Chinese 2017 financials for each of the company’s financial leasing subsidiaries. The Kaifeng balance sheet, shown below in translation, reveals much more debt than the U.S. financials disclose. Kaifeng Financing Lease (Hangzhou) Co., Ltd.
Shanghai Yixin Financing Lease Co. Ltd.
Everything about Uxin suggests a company whose chief raison d’etre is to hoodwink investors as much as possible in order for a few people in management to make a bundle of money from selling highly priced stock. There is no reason for public investors to play along. We are using the 2017 balance sheet as an apples-to-apples comparison because Chinese financials are reported annually so we do not have quarterly statements to compare with Uxin’s. Although we have not consolidated financials of Uxin’s Chinese operating companies, only one company, Kaifeng Financing Lease, has borrowings in 2017, and that company’s payables and receivables do not suggest heavy inter-company transactions. “With the Brushing Proportion About Half, Uxin Second-Hand Car’s Financial Numbers Attract Suspicion,” Southern Finance Net, March 22, 2017 刷单比例近半，优信二手车金融数据遭质疑_南方财经. J Capital uses the Chinese format for names, putting the surname first. Disclosure: I am/we are short UXIN.